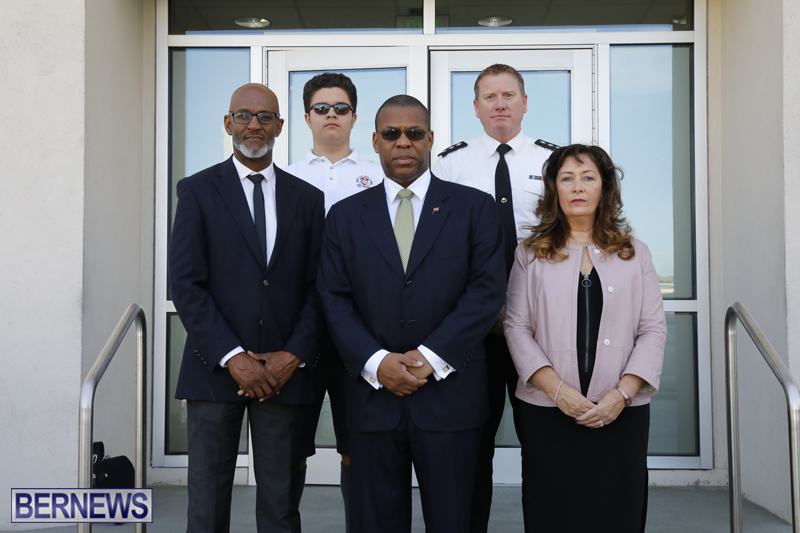 [Updated] The Bermuda Police Service, Minister of Transport & Regulatory Affairs Walter Roban, and representatives from the Bermuda Road Safety Council and CADA held a press conference this morning [Dec 7] to discuss road safety. The press conference has just concluded and we will have additional information later on, and in the meantime the 27-minute live video replay is below. Road safety is a very serious issue and I have a simple message for all drivers, but especially for young male drivers. Slow down. Our roads have no room for error. Stop making other drivers react to your excessive speed. Many don’t have your highly-tuned reaction times. In addition…and this is something you will hear again and again today…do not drive when impaired. This is higher than the second leading cause, which is homicide, and the third leading cause, falls, combined. In Bermuda, transport accident rates among males are nearly three times higher than the OECD average. In 2015, motorcycles were involved in close to 90% [actual figure 87.5%] of deaths due to transport accidents. In fact, in 2015, Bermuda had the worst rate of injury in road traffic collisions of all 35 OECD countries. I urge you to plan ahead at this time of year when parties are common. Think about and arrange transportation home in advance. Appoint a designated driver. Take public transport or take a taxi. If you are impaired and you are at a friend’s home, stay over. Don’t ruin your family’s holiday and possibly another family’s holiday with the stress of hospital visits or worse. As the Minister of Transport and Regulatory Affairs, I can assure you that my Ministry supports the Bermuda Police Service, CADA and the Road Safety Council in this very important collaborative effort to save lives. Good day, My name is Noah Brady-Soares, I am the Junior Chairman of the Bermuda Road Safety Council. I am here today to speak to my peers, in regard to making smart decisions while we are out riding on the roads. I understand that we all may think we are “Top Riders”, and that nothing is going to happen to us while on the roads, but one never knows. Nonetheless, I would like to emphasize that when you get on your bike and you are wide-open down the road, just remember that if you get hurt, you are also hurting your family, as well as somebody else possibly. Nobody likes to get a phone call saying their loved one has been involved in a collision. I understand that we may think rules are “stupid”, however they are implemented for our benefit and safety. We have all been there when a friend needs a ride home, and it’s just down the road, but on the way, if something happens and you are involved in a collision, or pulled over how will you feel. While you feel that you might be helping, you are breaking the law and however innocent the act might be, the law is the law, and we must abide by it. So, as we go into this holiday season we must be mindful that while we will be at parties with family and friends, we also need to remember to make smart choices, and if need be call our parents or a trusted friend for that ride, and not suffer any consequences later. The pain of the sudden death of a loved one on our roads is indescribable, I speak from experience. The aftermath for families and friends is lifelong. You never get over it and live with that pain every single day. The police can’t be everywhere, and the government is not to blame for you making the decision to speed, drink and drive, make that nip on your bike or do wheelies on a blind bend. Take some responsibility and have some respect for yourself and other road users. Go to the track if you want to do stunt riding, the public road is not yours alone and the danger you present to other road users is unfair! Road Side Sobriety testing that the Government has spoken of recently will change the culture and attitudes. We cannot afford to lose anyone else in 2017, we are at 14 already and the countless life changing injuries already suffered on the roads. 5 people every day going to KEMH for treatment following a collision – the cost to Bermuda is out of proportion to our size, scale and ability as an educated country. When you get on that bike or behind that wheel tell yourself ‘Not One More’ and ‘I am not going to be next’. Statistically, over the Christmas Season we will lose another life on the roads, this will be in addition to the 14 lives already lost. Whilst not intended to sound morbid, the reality is – could this be you or your loved one? As we reported already, in the period between Friday and Monday last there were 21 collisions. This saw people severely injured and hospitalized in the Intensive Care Unit. In the two weekends prior to this there were 7 collisions over each weekend. In light of the collisions we saw last weekend in comparison to the weekends before it is apparent that the Christmas Season is heating up already. Office parties and other social events have started. The Bermuda Police Service Roads Policing Unit has increased road safety messaging on our Twitter account. To date we have over 600 followers. We are communicating out by posting our road safety messages, statistics and CCTV clips of collisions. Followers are invited to join Roads Policing on Twitter for a virtual ride along. In addition to maintaining our role of increasing awareness we also recognize that we have an enforcement role. That said the Bermuda Police Service will be realigning resources to ensure that we have a robust preventative policing presence on our roads. We will focus our energy on the most at-risk behaviours on our roads that threaten life – this includes dangerous driving/riding and impaired driving/riding. To Bermuda – Bermudians, visitors and our Guest Workers – do not become a statistic. Slow down, do not drink and drive, do not allow anyone you are with to drink and drive – take keys, it is worth it. Everyone will be missed be someone. The Minister is correct to say that it is a crisis – yet Government is not treating it as such. As I have said before, repeatedly, if this was a health crisis caused by an illness (an epidemic) Government would be throwing money at it. Telling people to slow down, not to drink and drive etc are a waste of words – they have been uttered before, ad nauseum, and quite clearly it does not work. Yes, people must take responsibility for their own actions, but when people refuse to do so, Government has to step in to provide the legislative framework and resources to make people change their behaviour. Will legislation for roadside sobriety testing be tabled this parliamentary year – we were told it would be …. The police have never let silly things like constitutional rights stop them from denying people their right to free movement when they pull people over for suspicion under the misuse of drugs act or the more recent ‘stop and search’ policy. I didn’t know that we lived in a communist state. Do you want Government to legislate every single action of our daily lives. When will people start to take responsibility for their OWN actions. When will people young and old, black and white, male and female, local and foreigner change the NOT ME mentality. Its easy for you Mr. Deacon to sit there NOW and write your words, BUT when you where at the daily, how many times did you SIR, write about the same issues. I don’t think so. I’m not taking responsibility for some drunkard running a red light and putting me in hospital or worse. It’s clear that people aren’t taking responsibility for themselves or innocents, so government, tasked with arranging for a more productive and safe society, should take whatever steps – and extrapolating to communism is insane. We want govt to protect lives, not turn into the Gestapo. Yes, “individuals” must take responsibility for their own actions, but when “individuals” refuse to do so, Government has to step in to provide the legislative framework and resources to make “individuals” change their behaviour. The trouble is everytime individuals are the source of accidents, everyone is then penalized. Here is a novel idea, penalize harshly those actually having the accidents. Simple isn’t it! Well look, the Minister of transport! Oh another photo op, never mind. and if he didn’t show up, then you would say he didn’t care. Didn’t know we worked on a boat together! SO tell me other then photo ops and leading up to the election, have you seen or heard from the minister? All we get is bus cancellation updates, he was very outspoken prior to the election. Oh, the police are tweeting about it. That’s just great. How about doing it the old fashioned way and get those bike cops behind every bush and inside hidden driveways like it used to be in the early 1980s. It worked really well. The fines from all the offenders would pay for the police time. Tweeting won’t do anything and you should damn well know it. Making traffic a nightmare this morning to give the impression you are doing something about it is kind of pathetic. That is exactly the issue and why they haven’t come to grips with improving road safety. Hiding in the trees catching people for speeding, does little for improving road safety, all it does is generate revenue. A visual presence would be more effective and targeting actual risky behavior. Focus should be where, why and how the accidents are happening and look at how to improve. This also goes for all road users, as noted above in “Related Stories” no one is excluded from making errors. The other aspect is condition of the road surfaces and environment. Many roads are so polished and slick in the rain, some driveways have no drainage grate so when it rains they leave sand and gravel strewn in the roads a dangerous hazard for cycles. It seems to me that one of the main problems is the how fast bikes have become. Bda used to only allow bikes up to 50ccs for 16 to 18 year olds and 100ccs for over 18s. Now Bda allows the larger bikes up to150ccs. These newer bikes have a much faster take off speed and top end speed. I am sure most people don’t realize that they are travelling over 50kph. My suggestion is that Bda only allows electric bikes to be imported and ban importing gas powered bikes. Also put a 8 year moratorium on bikes already here. This won’t be very popular but it would help to save lives. Maybe Bda should ban all these big fast cars. Oh this island’s would be much more pleasant to drive on. Some quality statements, but frankly it’s all hot air without anything to back it up. The people in most need of the messages and warnings are not going to pay this any mind. The Minister of Transport and colleagues have to lead from the front and pledge to tackle this epidemic, this driving culture. Take whatever legislative options available and apply them. To the MPs: lobby hard for stronger punishments for traffic law violations. Think outside the box. Think about what would deter *you* from driving dangerously on our roads. To the police: be visible and alert, and not just in the low-hanging fruit areas of East Broadway, etc. Be seen as encouraging good behaviour. Take advantage of the video footage you’ve been acquiring and distributing on social media. When you pull people over for risky overtaking, show them the footage of the guy getting cleaned out on a wet road. Even if it’s just to apply a warning vs an actual ticket. No matter what the Government or the RSC and police say or try to do people are going to do what they want. Kind of like the PLP ministers inna? Talk is definitely cheap. Getting caught and fined (and potentially having their vehicle impounded) is the only thing that people are relatively scared of. 1. CADA – start looking at alternative ways for people to get home after drinking, the taxi’s are NOT reliable and many do not show up late at night. What OTHER solutions do you have? 2. Police – this whole stopping people at middle road stop light in the morning during rush hour is a JOKE. The issue is not people 3rd laneing, its people speeding or drink driving at night. Put some people bikes on the road at night. 3. There has been a massive increase in the amount of cars and trucks on the road. What happened to 1 car per family? This is why we have so many people 3rd laneing because there are WAY to many cars on the road. Well at least there are less busses to crash into. LOL, BUT I did see one hit a car last Saturday morning on front street, another bites the dust! Junior Chairman, people think the rules are stupid because some of them are, for instance: failing to stop for police is a $150 fine, drive the wrong way on a one way $50, operating an unlicensed vehicle $150, having no license to drive $150, yet ‘third laning’ is $800 whether it is a bike safely going between two lanes of traffic that are stationary or crawling along, or a car that forces a police car to hit the sidewalk to avoid a collision. The due care charge is too much of a fine for the act of cutting through morning traffic, at $800 it is the same as driving drunk (on the rare occasion someone is actually caught) and that is clearly stupid. Due care should be reserved for bikes/cars exceeding the speed limit through traffic causing oncoming vehicles to take evasive action, it could conceivably be tacked onto a DUI since drunks drive without due care as a result of being impaired. Roadside sobriety checks will be as ineffective as the current DUI laws since the will to enforce it is not there. Only 4 DUI’s over the last weekend shows Police are ignoring the problem as they watch people leaving our many licensed bars or functions, and then ride or drive themselves home, every single day. The fact we allow 0.8 blood/alcohol levels is an endorsement of drinking and driving. I wonder if that 0.08 (not 0.8) is set to allow for circumstances where someone has eaten or taken a food product with minimal alcohol content, with no aim to be intoxicated? Could someone eat say, a cake with a rum sauce topping and be at 0.08? Could gargling with Listerine put you at a certain blood alcohol level? What goes into setting minimums? Let’s get a breathalyzer and test it out. I think it is so those who “only had two beers officer” can slide through, or those who drank, and/or crashed, a couple hours before being tested. What is dangerous is how intoxicated or impaired is someone at 0.8 (experiments I have seen show folks don’t realize how little alcohol it takes to badly affect decision making, balance and driving ability etc. ), for instance a 4ft tall 90 lb 18 year old compared to a career alcoholic who is 6’6″weighing 300lbs will experience totally different levels. And how about we get the ‘cell phone/devices analyzer’ out as well ? We now know that playing with the things results in as many if not more crashes than booze . This has all been said before and to no avail. Instead of punishing people, lets try and provide alternatives. At the end of the day it is in our DNA to drink. Why not provide free public transport on certain routes after 8pm until 3am? Overtime for the bus drivers and safety for the passengers. Where will the money come from? Well that’s the challenge now isn’t it? Well said Cow Polly. I am tired of hearing that police will be out in force and road side testing etc etc. WHERE ARE THE OPTIONS FOR PEOPLE TO GET HOME? Taxis NEVER show up, or they are extremely rude or they are super expensive. We need other modes of transport. If they want to have drinks at a bar may be they should put their vehicle keys on the bar first, the life they save could be their own, how do they know what the bartender puts in the glass. The old Bermudiana hotel used to water down the drinks. very interesting your strong views now. why did you not address these and a number of issues when you had the pen of influence. You ring very empty right now. This makes no sense, slamming a contributor when it’s the message that should be analyzed. What does it matter? The daily has an editorial right now that talks about the issue. Does that article carry more weight than whatever’s posted here?